With close to a decade on the online casino scene, BetAt Casino has become a prime destination for online casino gamblers from most corners of the world. BetAt Casino was launched in 2011 and offer a safe and secure gaming environment spiced up with a great collection of games and bonus promotions that appeals to most player types. The games platform includes several top-ranking casino vendors such as Microgaming, NetEnt, Yggdrasil, 1X2 Gaming, ELK Studios, Big Time Gaming, Quickspin, Wagerlogic and Leander Games. This combination provides a great product that allows the player to enjoy both the most sophisticated slots and exciting bonus promotions. BetAt Casino is supported on all devices and operating systems so you can get the same excellent casino experience whether you prefer to gamble on your smartphone, tablet or desk/laptop. The website is designed in a simple and straight forward way which is very positive in terms of the customer experience. The game lobby includes different filtering options such as by game types (video slots, table games, live casino etc) and by game providers. There’s also a search function available where you enter the game title to locate your favourite game. In short, BetAt Casino is straight to the point – without any disturbing fuss. The help desk is available 24 hours a day, every day of the year. The support can be reached by using e-mail or the live chat which as available all over the site on the right side of the screen. The customer support team is quick, friendly and clear in their communication with customers which is a great “thumbs up” for an online casino. BetAt Casino is currently only available in the English language. BetAt Casino is operated by Max Ent Limited, a company registered in EU (Malta). They are licensed by the UK Gambling Commission and the Malta Gaming Authority. BetAt Casino meets the highest standards of player safety, fairness and responsible gaming policies. Exclusive New Player Bonus: Sign up and get 25 No Deposit Spins in Starburst Immediately! Click here and join BetAt Casino and claim your 25 No Deposit Spins in Starburst! BetAt Casino Welcome Bonus: Get a First Deposit Bonus of 100% up to £/€/$150 + 50 Free Spins in Starburst Video Slot! – The maximum bet applicable for these bonuses is in the value of €/£/$5.00/Kr50/Rub375. 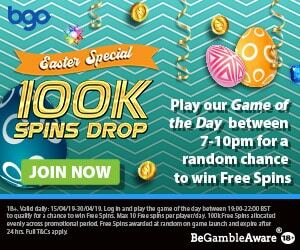 Click here and join BetAt Casino and get your First Deposit Bonus of 100% up to £/€/$150 + 50 Free Spins! More Promotions at BetAt Casino: Daily and Monthly Cashflow! As a members of BetAt Casino you will be able to get on the payroll with their Daily and Monthly Cashflow promotions. They way this works is basically as a normal cashback deal. The Daily Cashflow will get you up to 25% cashback on your losses from the day before. If you have won, you will still get something extra like free spins or a cash bonus. The Monthly Cashflow is obviously calculated on your monthly spending’s and you will get a straight 10% cashback bonus which is paid out on the first working day of the new month. This promotion is subject to terms and conditions. BetAt Casino offer a wide range of different payment and withdrawal options to choose from like Visa, Mastercards, NetEller, Moneybookers Skrill, PaySafe Card, Zimpler, Moneta, Klarna, WebMoney and several different direct bank transfer solutions. All transaction and stored information are protected by the most sophisticated encryption technology available. Popular Online Video Slots at BetAt Casino! BetAt Casino house a great collection of online video slots which are provided by the best game producers in the online casino industry. As a member you can enjoy hundreds of different video slots from NetEnt, Microgaming, ELK Studios, Quickspin, Big Time Gaming and many more. The most popular video slots at BetAt Casino are BerryBurst, Starburst, Swipe’n Roll, Book of Gods, Dead or Alive, Dolphin Coast, Jumanji and Guns’n Roses.